If need be, you can use two strips of tape bonded over one another. When re-assembling the flange, you can work with the usual assembly torque – then fit and forget. There is no need to re-tighten the bolts with KLINGERsealex. hours, then you can reduce the applied bolt load by half. Tested for oxygen at 60 bar and 125°C. Also suitable for liquid oxygen. Federal Mechanical Testing Authority): Certification No. 3/4872. conventional gaskets. Furthermore, you have the secutity knowing that you are equipped for all eventualities. have the details of your particular application requirements. The following applications of KLINGERsealex will give you some idea of the innovative uses of this product. Further references are available on request. would otherwise have been used. 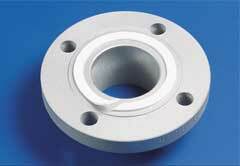 well to all flange sealing conditions and possess outstanding resistance to paint solvents and cleaning agents. Aggressive agents at 5 bar and 32°C. conveyed via a pumping station and associated piping system. solution becomes a permanent fixture. Clean flanges, cut off a lenght of KLINGERsealex slightly longer than the actual circumference of the seal. force and bolt tightening patters.